Strange things are happening in Italian football. Either we have been collectively sent back 20 years in time, or a team that's not based in Milan, Torino or Rome is a real title contender 26 weeks into the season. Led by the seemingly unstoppable Edinson Cavani, Napoli's attack is one of the best in the league, but it's the return of the 3 man defense that's proved intriguing and decisive on many occasions. Going into this match after a hard-fought victory against Chievo, Milan has everything to lose by putting in a lackluster performance on Monday. More often than not, Napoli depends on Lavezzi for the final pass that leads to a goal. The universally gifted forward will drop back, distribute the ball, play a 1-2, run into space and serve Cavani on a platter before you can say counterstrike. Giuseppe Mascara played a similar role in his Catania, but when he fills in for Lavezzi on Monday he will find himself in a team he doesn't have a great understanding with yet, and this will work to Milan's advantage. Any uncoordinated movement from Mascara allows more space and time to mark Cavani and close down Sosa or Hamsik. With van Bommel in front of Thiago Silva and Nesta, we don't have to worry too much about Napoli penetrating through the middle. However, just as often, Napoli plays a rather simple game - take the ball, send the ball to the flank, find Cavani, Cavani scores. It's interesting to notice that the three key players for this gameplan - Cannavaro, Maggio and Cavani - were rested in a (very important) Europa League game on Thrusday. This fact, along with the fact we will be using a makeshift left back to counter Christian Maggio, is alarming and hopefully Allegri is thinking of ways to neutralize this threat as I type this. Napoli's right flank could easily be the most important part of the pitch on Monday, and the game could be won or lost by whoever is chosen to play against Maggio on that side. Personally I'd say Emanuelson is our best bet for the critical left back position, quite simply because Milan's best bet is to pin Napoli back and never let go. Emanuelson seems confident in possession and we know he has the pace to keep up with a counter attack. These two facts make him look like the best choice, his tactical intelligence is a mystery to me but I highly doubt he could be a worse left back than Massimo Oddo. Dossena on the other side is dangerous as well, but as my confidence in Abate grows with every game, I have no reason to doubt he will do his job once again. The 3-4-1-2 (or 3-4-2-1) relies heavily on the work-rate of the two wide players, so it wouldn't surprise me if we saw Napoli start strong in order to try to get the most out of the first 15 minutes, just like Tottenham did last Tuesday. As the match wears on, with Milan taking over possession Maggio and Dossena should be burdened with more and more defensive responsibilities and thus a very important battle could be won. With no real fullbacks to speak of and Robinho drifting out wide, pulling a defender with him, it's to be expected that Ibrahimovic and Pato/Cassano should have some two-on-two situations against two central defenders. For this to ever happen, it is imperative that the midfield manages to find a way to move the ball from defense to attack quickly. If Boateng is fit, he needs to get the nod in order to make this possible. Personally, I'm torn between Cassano and Pato for this game. 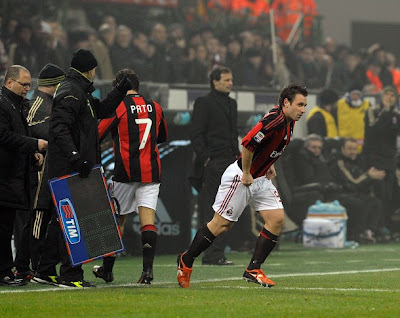 Cassano's vision may just prove more effective than Pato's pace and dribbling, but with the raw physicality of the Napoli back line, I'd say Cassano would be most effective if brought on for the last 30 minutes or so. Who for? That remains a question to be answered during the game. The first game between Milan and Napoli was won by a miracle performance from Oddo who came through with two assists after coming off the bench, but I wouldn't count on an act of God to beat Napoli for the second time. My co-blogger Elaine covered the Cavani threat in an article earlier this week, which is why I won't go into the details and difficulties of the task that awaits the Milan back line. With proper work from the midfield and the flanks, Thiago Silva and Nesta should be capable of handling the Uruguayan matador. This is bound to be a tough game, but if Milan can pull off a win, it will take us a big step closer to winning the title, so with that in mind, Forza Milan and good luck to the team!